I’ve just updated this site with some of my writing, including some old interviews and reviews. I’ll be posting a lot more, including some poetry and fiction soon. Stay tuned. John Reischman, Sharon Gilchrist, and I have released our new recording: The Harmonic Tone Revealers. You can order downloads and CDs at CDBaby.com and downloads at Bandcamp, and it’s also available, on iTunes, Amazon, Spotify, etc. This was a blast to make and I hope people enjoy our take on some of the gems of the traditional old-time and bluegrass canon. Here’s what I said about it in the liner notes, along with a tune list. On our last tour, John, Sharon, and I played at Empty Sea Studios in Seattle, and the Roots Channel just posted video of our performance. Check it out here. Tuesday Oct 28, House Concert, Berkeley, CA. Email info@sharongilchristmusic.com for reservations and information. Wednesday Oct 28, The Headwaters Room of Geos Institute, 84 Fourth Street, Ashland, Oregon, 7 pm. Call 541-552-1665 for tickets. 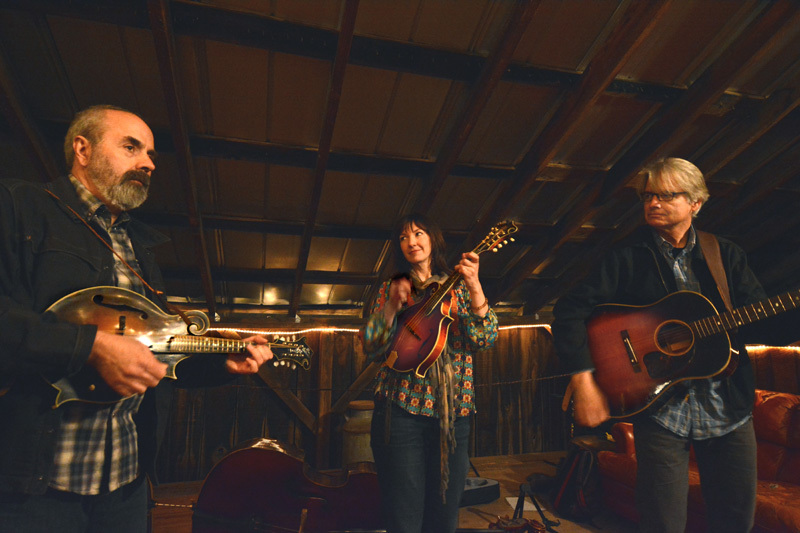 Ship in the Clouds is a new trio with yours truly, Jake Schepps (banjo), and Alisa Rose (fiddle), playing an eclectic mix of string music, including Bartok, Brazilian choro, and original bluegrass-oriented instrumental tunes. We’ll set sail with a short Northern CA tour. Nov 13: Duende, Oakland, CA, 8 pm. Ship in the Clouds. Nov 14: Viracocha, San Francisco, CA. Ship in the Clouds and the Rob Reich Trio. Nov 15: Music Near the Hearth, Sunnyvale, CA. 6:30 pm. Ship in the Clouds. Nov 16: Arcata Playhouse, Arcata, CA. 8 pm. Ship in the Clouds. As many of you know, for the last 10 months or so, I, along with my partners Dan Gabel and Teja Gerken, have been hard at work on a new roots-music instruction, gear, and news site called Peghead Nation, which I am overjoyed to announce is now live!! We’ve got 15 courses in various styles of guitar, dobro, fiddle, mandolin, banjo, and ukulele, with illustrious instructors like Bill Evans, Mike Witcher, Sharon Gilchrist, Teja Gerken, Stevie Coyle, Brittany Haas, Chad Manning, Orville Johnson, Marcy Marxer, Adrianne Serna, and yours truly. I’m teaching two courses: Flatpicking Guitar and Weekly Guitar Workout, a series of weekly exercises designed to help guitarists learn the fingerboard. We’ll also have CD reviews, performance videos, instrument demos, and more. So please check it out, sign up for a course (or two), and let us know what you think of our new Peghead Nation. Come on out to the Sleeping Lady in my hometown of Fairfax, CA, for a little guitar round-robin with fingerstylist supreme Teja Gerken and sideman-to-the-stars (and phenomenal solo guitarist) Mark Goldenberg. Sept. 10, Sleeping Lady Cafe, 23 Broadway, Fairfax, CA. 9 – 11 pm.